Many of the main characters as they appear in the anime. The top row from left to right: Kazuha Toyama, Heiji Hattori, Sonoko Suzuki, Ran Mori, Kogoro Mori, Eri Kisaki and Hiroshi Agasa. Bottom row from left to right: Genta Kojima, Mitsuhiko Tsuburaya, Conan Edogawa, Ai Haibara and Ayumi Yoshida. 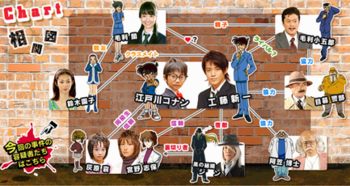 A relationship diagram for the main characters as they appear in the second episode of the live action drama series. The manga series Case Closed, known as Meitantei Conan (名探偵コナン, lit. Great Detective Conan, officially translated as Detective Conan) in Japan, features a large number of recurring fictional characters originally created by Gosho Aoyama. The series takes place in modern-day Japan and follows amateur detective Jimmy Kudo who solves cases in an episodic fashion while in his childhood body and under the alias Conan Edogawa. He is joined by childhood friend Rachel Moore and her father Richard Moore who runs a detective agency. Throughout the series, Conan interacts and befriends many characters from various groups: the Tokyo Metropolitan Police, the local police in Conan's prefecture; The Junior Detective League, a group of children who solves mysteries for their clients and the FBI. He also befriends a few individuals who know of his true identity: Dr. Agasa, who provides Jimmy with various spy gadgets; Harley Hartwell, a high school detective from Osaka and Anita Hailey, the original developer of the poison who had also transformed into a child. The manga became licensed by Viz Media while the anime adaptation was licensed by Funimation. The two companies have Americanized many of the character names with both companies using different names or spellings for the same characters on several occasions. Other English editions such as the ones published in Singapore by Shogakukan Asia romanize the Japanese names. The list follows the names as presented by the Viz Media manga. Jimmy Kudo, known as Shinichi Kudo (工藤 新一, Kudō Shin'ichi) in Japan, is the main protagonist of the series, a high school detective who solves difficult cases for the police.[ch. 1] During one of his investigations, he is attacked and forced to take an experimental poison by a member of the Black Organization. However, due to a rare side-effect, he shrinks to the form of a young child.[ch. 1] In order to keep his true identity a secret, he now goes under the alias Conan Edogawa (江戸川 コナン, Edogawa Konan) and pretends to be a real child to throw off suspicion while he secretly solves many cases and looks for clues about the organization.[ch. 2] He loves his childhood friend Rachel Moore, but cannot confess his feelings or reveal his true identity in order to protect her.[vol. 1] His two Japanese voice actors are Kappei Yamaguchi for Jimmy and Minami Takayama for Conan. He is voiced by Jerry Jewell for Jimmy and Alison (Retzloff) Viktorin for Conan in the English localization. In the first and second live drama he was portrayed by Shun Oguri in teenage form and Nao Fujisaki in child form. In the dramas following the two, he is portrayed by Junpei Mizobata. Amy Yoshida, known as Ayumi Yoshida (吉田 歩美, Yoshida Ayumi) in Japan and dubbed by Funimation as Amy Yeager, is Conan Edogawa's friend and classmate.[ch. 17] Amy was the sole female member of the Junior Detective League until they got Anita Hailey to join. She has a crush on Conan, which makes him uncomfortable,[ch. 39] and was jealous that Anita attracts Conan's attention,[ch. 201] and that Conan seems to be attracted to Rachel.Film: Countdown She is a naive and innocent little girl who shows courage from time to time and acts as the team's cheerful spirit. Amy and Anita later become good friends, referring to each other on a first name basis and adding "-chan" in the Japanese version.[ch. 400] Her Japanese voice actress is Yukiko Iwai and her English voice actress is Monica Rial. Mitch Tsuburaya, known as Mitsuhiko Tsuburaya (円谷 光彦, Tsuburaya Mitsuhiko) in Japan and dubbed by Funimation as Mitch Tennison, is a friend of Amy Yoshida and George Kojima who enjoys reading science books and takes a scientific approach to problem solving.[ch. 17] He is infatuated with Amy,[ch. 39]Film: Countdown and later Anita Hailey. He is a smart and well-read first-grader who believes that technology can solve most problems. It was shown that his parents are both teachers, and he has an older sister named Asami Tsuburaya who is two years his senior. His Japanese voice actress are Ikue Ōtani (mainly) and Ai Orikasa (episodes 425-436 and Case Closed: The Private Eyes' Requiem due to the former having maternity leave), while his English voice actor is Cynthia Cranz. George Kojima, known as Genta Kojima (小嶋 元太, Kojima Genta) in Japan and dubbed George Kaminski in the Funimation anime and sometimes the Viz manga,[vol. 63] is the overweight, self-proclaimed leader of the Junior Detective League. He loves food and can eat more than all the other Junior Detective League members combined. Even though he can be intimidating, he is actually very kind. He is a friend of Amy Yoshida and Mitch Tsuburaya, and has been shown to admire his father, who owns a liquor store.[ch. 303] Both he and Mitch have a crush on Amy,[ch. 81] and they both envy Conan since she likes him. His Japanese voice actor is Wataru Takagi and his English voice actor was Dameon Clarke for the first 4 seasons and Mike McFarland taking over the role beginning with the fifth season. Shiho Miyano (宮野 志保, Miyano Shiho) is a former member of the Black Organization under the code name Sherry (シェリー, Sherī).[ch. 178] A gifted chemist at a young age, she is the inventor of APTX 4869, the poison that shrank Jimmy Kudo. Both her parents and sister, Akemi Miyano, also worked for the organization.[ch. 179] Shiho betrays the organization after Gin killed her sister.[ch. 179] She took the drug in a suicide attempt, but rather than dying, she, like Jimmy, became small. When she was 18, she escaped the organization and went into hiding.[ch. 458] She is taken in by Dr. Agasa and is given the alias Anita Hailey: known as Ai Haibara (灰原 哀, Haibara Ai) in the original Japanese version, and dubbed Vi Graythorn by Funimation. Her alias is derived from the detective characters Cordelia Gray and V.I. Warshawski;[ch. 179] "Hai" can mean "gray" in Japanese and "Ai" is pronounced the same as the English letter "I"; however, in one of the interviews, Gosho Aoyama confirmed her name was a reference to Irene Adler from Sherlock Holmes. She shows affection towards Jimmy, but she denies having such feelings.[ch. 191, 201] Despite being constantly in the company of the Junior Detective League and Rachel Moore, she was very reserved and only opened up a little more to Rachel and Amy after some time; she later lets Amy call her "Anita-chan" instead of the more formal honorific "Anita-san".[ch. 400] She often helps Conan solve cases and find information on the Black Organization to help bring them down in addition to working on the cure to their condition. She has strawberry blonde hair.[ch. 238] She grew up in the United States,[ch. 303] is half-Japanese[ch. 398] and half-English.[ch. 411][vol. 49] Her Japanese voice actress is Megumi Hayashibara and her English voice actress is Brina Palencia. In the live drama, her teenage form was portrayed by Yuu Kashii and her child form by Shibota Kyoka. Herschel Agasa, known in Japan as Hiroshi Agasa (阿笠 博士, Agasa Hiroshi),[vol. 40, 49:extra] appears as an absent-minded professor and neighbor to Jimmy Kudo. He is one of the few characters in the story who knows of Kudo's predicament and helps hide his identity as Conan Edogawa, inventing devices such as the voice-impersonating bowtie, tracking glasses and badges, and enhanced shoes and hoverboards, and an instant soccer ball so Conan can fend for himself. He often watches over the Junior Detective League and takes them on trips in his old VW Beetle.[ch. 111, 200] After finding Shiho Miyano on the streets, he takes her into his care and gives her the alias Anita Hailey to hide her from the Black Organization.[ch. 179] His Japanese voice actor is Kenichi Ogata. In the Funimation English dub, his name is spelled Hershel Agasa, and he is voiced by Bill Flynn. Serena Sebastian, known in Japan as Sonoko Suzuki (鈴木 園子, Suzuki Sonoko), is Rachel Moore's best friend.[ch. 40] She has light brown hair and comes from a wealthy family with a high social status, although she does not flaunt this, preferring to be an outgoing social girl who chases after and flirts with attractive boys. She is a huge fan of the Kaitou Kid. When Richard is unavailable, she is usually the person Conan knocks out and impersonates to solve cases instead, to which she sometimes thinks she too is a brilliant detective.[ch. 44] In later chapters, she has a long-distance relationship with Makoto Kyogoku (京極 真, Kyōgoku Makoto), a karate champion at Haido High School.[ch. 221] Her Japanese voice actress is Naoko Matsui and her English voice actress is Laura Bailey. She was portrayed by Mayuko Iwasa in the first and second live drama, and by Sayaka Akimoto in the third live drama. Kazuha Toyama (遠山 和葉, Tōyama Kazuha), Kirsten Thomas as dubbed by Funimation, is Harley Hartwell's childhood friend and a daughter of a commissioner who is positioned high in the Osaka police department. Harley and Kazuha's fathers are close friends. Her relationship with Harley closely mirrors Rachel Moore's with Jimmy Kudo; she is too shy to admit that they feel more than friendship for their respective partner. She and Harley share a pouch with a broken handcuff link which is their good luck charm.[ch. 186] She was, at first, jealous of Rachel because she mistakenly assumed that Rachel was in love with Harley and had a lot of coincidental similarities with him.[ch. 185-188,211] Upon finding out about Rachel's and Jimmy's relationship and Rachel's kind personality, she later becomes close friends with Rachel. She is also a skilled 2nd-degree blackbelt in Aikido.[ch. 188] Her Japanese voice actress is Yūko Miyamura and her English voice actress is Gwendolyn Lau. She is portrayed by Rei Okamoto in the live drama. The primary antagonists of the series is the crime syndicate called the Black Organization (黒の組織, Kuro no Soshiki). The Organization has been known for its involvement in several felonies which range from blackmail to assassinations.[ch. 16, 500] Conan's main objective is to bring them down, knowing that he can not return to his life as Jimmy unless doing so, for the sake of protecting his family and friends. The members of the organization are given code names based on alcoholic beverages. The identity of the leader of the Black Organization had been a mystery for most of the series as only text messages have been sent. Gin (ジン, Jin) is a high-ranking agent in the organization,[vol. 49:extra] a merciless killer who fed the APTX 4869 poison to Jimmy Kudo.[ch. 1] He drives a black Porsche 356A and is also known as Melkior.[ch. 238] Despite his aggressive demeanor, he has repeatedly shown to be a highly cunning and deductive man, seeing through any deception perpetrated against him. His Japanese voice actor is Yukitoshi Hori and his English voice actor is Troy Baker. He was portrayed by Sasaki Kuranosuke in the live drama. Vodka (ウォッカ, Wokka) is a member of the Black Organization and is Gin's partner. He is usually seen alongside Gin. Unlike Gin, Vodka is slow-witted and easy to trick. His Japanese voice actor is Fumihiko Tachiki and his English voice actor is Christopher Sabat. He was portrayed by Taro Okada in the live drama. Vermouth (ベルモット, Berumotto), dubbed Rotten Apple (ラットゥンアップル, Rattun Appuru) by the FBI,[ch. 434] is a mysterious member of the Black Organization.[ch. 242] Her appearance remains the same even after many years, suggesting she has found a way to sustain her youth.[ch. 433] Her true identity is Sharon Vineyard (シャロン・ヴィンヤード, Sharon Vinyādo), a famous American actress who mastered the skill of disguise alongside her friend Vivian Kudo.[ch. 350] When Sharon died, her daughter Chris Vineyard (クリス・ヴィンヤード, Kurisu Vin'yādo)[vol. 34] attended the funeral; but Conan later discovers Sharon had changed her identity to Chris.[vol. 42] She is cold-blooded and unflinching, carrying out the Black Organization's orders in the forms of murders and so forth without remorse. She knows Conan Edogawa's true identity as Jimmy Kudo and Anita Hailey's as Sherry, but keeps them a secret from the Black Organization because Jimmy and Rachel saved her life back in New York.[vol. 35][ch. 434] Her Japanese voice actress is Mami Koyama. Vermouth was inspired by Fujiko Mine from Lupin III and represents her bad side, while Vivian Kudo represents the good. Rena Mizunashi (水無 怜奈, Mizunashi Rena) is originally introduced as a news anchor for the local television who had moved from morning television to evening news. Conan discovers that she has been going under the alias Kir (キール, Kīru) in the Black Organization.[vol. 48] In the story where the Black Organization try to assassinate an upcoming politician, she is tasked to interview the politician at the park where the others can shoot him from afar, but Conan thwarts the attempt. She and Vermouth then try to stage an accident so that the politician will step out of his car and get shot, but she ends up getting in an accident instead of Vermouth, and is hospitalized under the watch of the FBI.[vol. 49] The FBI determine that Mizunashi's name is an alias for 007.[ch. 550] She is later revealed to be a double agent working within the Black Organization and reporting to the CIA. Her real name is Hidemi Hondo (本堂 瑛海, Hondō Hidemi)[ch. 604] The FBI manage to place Hidemi back into the Black Organization so she could continue to spy on them. To prove her loyalty to the Black Organization, Hidemi was ordered to kill Shuichi Akai.[ch. 609] Though under heavy surveillance, she reports information to Jodie Starling.[ch. 622] Her Japanese voice actress is Kotono Mitsuishi. Chianti (キャンティ, Kyanti) and Korn (コルン, Korun) are the snipers of the Black Organization.[ch. 500] Chianti is a goth-styled member with a blood thirsty personality.[ch. 500] Her Japanese voice actress is Kikuko Inoue. Meanwhile, Korn is an elderly man with an emotionless face who enjoys sniping his victims.[ch. 500] His Japanese voice actor is Hiroyuki Kinoshita. Akemi Miyano (宮野 明美, Miyano Akemi) is a low ranking member of the Black Organization under the alias Masami Hirota (広田 雅美, Hirota Masami). She is Shiho Miyano's elder sister and also Shuichi Akai's lover.[ch. 181] She steals one billion yen to use as a bargaining chip to free her little sister from the Black Organization but is killed by Gin.[ch. 16][vol. 49:extra] Her Japanese voice actress is Sakiko Tamagawa. Tequila (テキーラ, Tekīra) is a large intimidating member of the Black Organization who muscles people into making deals with his syndicate.[ch. 114] He is killed by a briefcase bomb which was meant for another person.[ch. 115][vol. 49:extra] His Japanese voice actor is Kōsei Hirota and his English voice actor is Andrew Chandler. Pisco (ピスコ, Pisuko), is a 71-year-old man named Kenzo Masuyama (枡山 憲三, Masuyama Kenzō), who was a chairman for an auto manufacturer. He was also close friends with Shiho's parents, although this does not shake his resolve to kill her. Gin kills him on orders from the boss for breaking the Organization's code of secrecy after being photographed as he committed a murder.[ch. 242][vol. 49:extra] His Japanese voice actor is Yasuo Maramatsu. Rikumichi Kusuda (楠田 陸道, Kusuda Rikumichi) was sent by the Organization to search for Rena Mizunashi in Haido Central Hospital. He was pretending to be a patient with cervical spine sprain in order to move around the hospital without suspicion.[ch. 597] He commits suicide when his cover is blown.[ch. 598] His corpse is used to fake Shuichi Akai's death.[ch. 609] He is voiced by Mitsuo Iwata. The characters of the Tokyo Metropolitan Police. 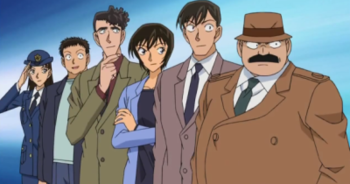 From the bottom going up, left to right, is Yumi Miyamoto, Kazunobu Chiba, Ninzaburo Santos, Miwako Sato, Wataru Takagi, and Inspector Joseph Meguire. The Tokyo Metropolitan Police is the law enforcement agency of Tokyo Prefecture. The most commonly recurring characters of the Tokyo MPD are members of Division 1 of the Criminal Investigation Section: Inspector Joseph Meguire; his subordinate officers, Miwako Sato, Wataru Takagi, Ninzaburo Santos and Kazunobu Chiba; and Joseph's new superior, Hyoe Kuroda. Officer Yumi Miyamoto and Naeko Miike of the Traffic Division also appears often. Miwako Sato (佐藤 美和子, Satō Miwako), Michele Simone as dubbed by Funimation, is a smart, highly attractive, energetic, and a dedicated young female officer who works for Inspector Meguire.[ch. 208] She is hugely popular with the male members of the police department, but is oblivious to the fact that her colleague Wataru Takagi likes her romantically. However, she gradually develops feelings for him as well.[ch. 330, 404] Her Japanese voice actress is Atsuko Yuya and her English voice actress is Kate Oxley. Wataru Takagi (高木 渉, Takagi Wataru), Harry Wilder as dubbed by Funimation, is an officer who works for Meguire. He has feelings for his fellow officer Miwako Sato,[ch. 171] and gets jealous whenever he hears she is interested in someone.[ch. 208-210,232-233] He sometimes deflects any praises and motivational compliments she might give.[ch. 232] Though he has an appearance of ineffectual nervousness, he is quick to assess a situation and take immediate and decisive action when necessary, and has a knack for getting out of situations out of sheer luck.[ch. 269,673] His Japanese voice actor is of the same name, while his English voice actor is Doug Burks. Nicholas Santos, known in Japan as Ninzaburo Shiratori (白鳥 任三郎, Shiratori Ninzaburō), is introduced as a recently promoted officer who works with Inspector Meguire. He is a member of the 1st Investigation Division. He has unrequited feelings towards Miwako Sato, and often tries to interfere in Sato and Takagi's dates[ch. 209-210][vol. 49:extra] In later chapters, he reveals the feelings originated from a young girl in his childhood who had a strong sense of justice and resembled Sato physically.[ch. 687] After meeting Conan Edogawa's elementary school teacher, Sumiko Kobayashi, Santos realizes she was the girl from his past and develops a relationship with her.[ch. 689] He is known to have good knowledge on wine and architecture. In Japanese, he has been voiced by Kaneto Shiozawa and Kazuhiko Inoue after Shiozawa's death in May 2000. His English voice actor is Eric Vale. Kazunobu Chiba (千葉 和伸, Chiba Kazunobu) is Takagi's partner and colleague.[vol. 49:extra] He is a light hearted officer and a fan of tokusatsu shows who mostly makes cameo appearances as an officer in the background. He had a crush on a girl named Naeko Miike (三池苗子, Miike Naeko) when he was young and whom shared a mutual affection. Unbeknownst to him, Naeko Miike recently transferred to the Tokyo Metropolitan Police Department. His Japanese voice actor is Isshin Chiba and his English voice actor is Chris Cason. Yumi Miyamoto (宮本 由美, Miyamoto Yumi) is a female police officer in the traffic department. She is friends with Miwako Sato and tries to push both Sato and colleague Wataru Takagi towards each other in a relationship.[vol. 30][vol. 49:extra] Her Japanese voice actress is Yu Sugimoto. Naeko Miike (三池 苗子, Miike Naeko) is a young female police officer who works in the Tokyo MPD traffic department directly under Yumi Miyamoto. She is also Kazunobu Chiba's childhood friend and love interest. She is voiced by Rie Tanaka. Inspector Yuminaga (弓長警部, Yuminaga-keibu) is from the Arson Investigation Section 1 of the first Division, who therefore deals with arson cases. Richard Moore, who was his subordinate at some point, nicknamed him "fiery old fossil". His Japanese voice actor is Natsuo Tokuhiro. Kiyonaga Matsumoto (松本 清長, Matsumoto Kiyonaga), dubbed by Funimation as Kiyonaga McLaughlin, is the superior officer of Inspector Meguire and his underlings.[ch. 78][vol. 49:extra] His brutish appearance and the scar running down his left eye easily hide the fact that he is a caring, if somewhat stern, father figure. He is widowed and has a single daughter, named Sayuri Matsumoto.[ch. 78] He received the scar on his face during a confrontation with a serial killer fifteen years prior to the series.[ch. 667] Recently, he has been promoted and his position is taken over by Hyoe Kuroda.[ch. 920] His Japanese voice actor is Seizō Katō and his English voice actor is Bob Carter. Hyoe Kuroda (黒田 兵衛, Kuroda Hyōe) is the former Nagano Police First Division Chief. He is currently the Tokyo Police First Division Managing Officer after replacing Kiyonaga Matsumoto who has been promoted.[ch. 920] He had been in a coma for ten years due to an accident and had pitch black hair before that.[ch. 914] His right eye was injured during that accident and it is replaced with an artificial one.[ch. 920] He is voiced by Yukimasa Kishino. Ginshiro Toyama (遠山 銀司郎, Toyama Ginshiro), known as Chief Thomas in the Funimation dub, is the Chief Criminal Investigator (or Chief Detective) in the Osaka police district, and Kazuha's father. He is close friends with Harley's father.[vol. 49:extra] His Japanese voice actor is Masato Sako and Shinji Ogawa while his English voice actor is Doug Burks. Goro Otaki (大滝 悟郎, Otaki Goro), known in the Funimation dub as Inspector Odin. Otaki is the head inspector of the Osaka district, and good friends with Heizo Hattori and Ginshiro Toyama. Otaki is also close friends with Heizo's son, Heiji, whom often calls Otaki when he needs to find information for an important case. Sometimes, Otaki even assists Heiji, and has a few times before lent a big helping hand in helping Heiji and Conan solve cases. His Japanese voice actor Norio Wakamoto while his English voice actor is Bill Jenkins. Kansuke Yamato (大和 敢助, Yamato Kansuke) is an officer from Nagano Prefecture Police, first appearing in the case of the murders where centipedes were placed by the victim's heads. He is a serious officer who is overly assertive when interrogating suspects. He has a pair of criss-crossed scars over his blinded left eye and a permanently injured left leg due to an avalanche accident which he sustained from chasing a criminal.[ch. 617] His name is based on the strategist Yamamoto Kansuke.[ch. 682] His Japanese voice actor is Yuji Takada. Yui Uehara (上原 由衣, Uehara Yui) is an officer from Nagano Prefecture Police and Kansuke Yamato's childhood friend and is secretly in love with him.[ch. 616] She is the opposite of Kansuke and is professional and considerate to others. When Kansuke was presumed dead, Yui resigns and takes it upon herself to marry into the Torada (虎田) family to investigate the death of another well-loved colleague.[ch. 618] She later rejoins the force.[ch. 681] Her Japanese voice actress is Ami Koshimizu. Takaaki Morofushi (諸伏 高明, Morofushi Takaaki), nickname Kong Ming (高明, Kōmei) as in the chancellor from the Romance of the Three Kingdoms, is a police inspector at the Arano Precinct in Nagano. He and Yamato have been rivals since they met at elementary school. He graduated top honors from the university and had joined the force without having to be a ranked officer first.[ch. 682] Morofushi's exploits were so well known that a book about a child who solved a case in an elementary school, titled "Little Kong Ming of Class 2-A" was based on him, while another character in the book was based on Kansuke Yamato. Morofushi cherishes the book, keeping it in the glove compartment of his car, as the author was a friend of his who died. He was originally a high ranking inspector in Nagano, until he abandoned his job briefly to try to find Kansuke when he was left for dead in the snow during a case. After Morofushi found the suspect and helped save Kansuke, he was demoted to an inspector of the local precinct.[ch. 684] He often quotes phrases from Romance of the Three Kingdoms. He is rather impulsive and prefers to work alone.[vol. 65] His Japanese voice actor is Sho Hayami. Misao Yamamura (山村 ミサオ, Yamamura Misao) is a young police officer from the Gunma Prefecture, Detective Magnum as dubbed by Funimation.[ch. 136] He is naive, clumsy, and not very bright and often tries to film the deduction shows of the sleeping Richard Moore on film but usually fails to do so. Since Conan has tranquilized him to reveal murderers so often, Yamamura was promoted to police inspector. His Japanese voice actor is Toshio Furukawa and his English voice actor is Kent Williams. Sango Yokomizo (横溝 参悟, Yokomizo Sango), Inspector Worthington as dubbed by Funimation, is a police officer originally seen with the Saitama police,[ch. 59] before being transferred to Shizuoka.[ch. 74][vol. 49:extra] He is quite a capable officer and comes off as intimidating due to speaking loudly and getting close to a suspect's face. His Japanese voice actor is Akio Otsuka and his English voice actor is Dameon Clarke. Jugo Yokomizo (横溝 重悟, Yokomizo Jugo) is an inspector for the Kanagawa police and the twin brother of Sango Yokomizo.[ch. 348] Both started their police career in Saitama, but some time later, Sango transferred to the Shizuoka district. However, they do stay in touch and have even assisted each other in various (and even locally unrelated) cases. His Japanese voice actor is Akio Otsuka. The FBI agents from left to right are Jodie Starling, James Black, and Shuichi Akai. Jodie Starling (ジョディ・スターリング, Jodi Sutāringu) is introduced as Rachel Moore's new English teacher from America under the name of Jodie Saintemillion (ジョディ・サンテミリオン, Jodi Santemirion).[ch. 270] She enjoys video games and is easy-going outside the classroom.[vol. 29-30] She is later revealed to be an FBI agent with a personal vendetta against Vermouth who murdered her father.[ch. 433] She knows of Conan Edogawa's detective skills and often has him help the FBI to battle the Black Organization. She had been Shuichi Akai's girlfriend before he met Akemi Miyano.[ch. 677] Her Japanese voice actress is Miyuki Ichijou. James Black (ジェイムズ・ブラック, Jeimuzu Burakku) is the head of operations on the hunt for the Black Organization in Japan. He first appears in volume 32 as an old guy with glasses and a moustache.[vol. 32] Since his revelation in connection with the FBI, he and his colleagues have worked closely with Conan whenever their common cause would bring them together.[ch. 502] His Japanese voice actor was Iemasa Kayumi. After Iemasa Kayumi's death, his Japanese voice actor is Takaya Hashi. Akai later appears as Subaru Okiya (沖矢 昴, Okiya Subaru), a young blond-haired man with glasses.[ch. 622] He stays at Jimmy Kudo's house with Conan's permission after his apartment had burned down.[ch. 624] He states he is a graduate student concentrating on engineering and is revealed to have high deduction skills, being a fan of Sherlock Holmes.[ch. 640] It is revealed later that he is Shuichi Akai in disguise, after his fake death and has come to realize that Conan Edogawa is actually Jimmy Kudo.[ch. 897] His Japanese voice actor is Ryōtarō Okiayu. Gosho chose the character's surname name from Char Aznable, a fictional character from the Mobile Suit Gundam series, who is nicknamed The Red Comet (赤い彗星のシャア, Akai Suisei no Shā). As for the personal name, Gosho took the given name of Char's voice actor, Shūichi Ikeda. When Shuichi was set to appear in the anime, Gosho requested Shūichi Ikeda to be the voice actor. André Camel (アンドレ・キャメル, Andore Kyameru) is a brutish-looking FBI agent introduced in the storyline when the FBI was planning to move Rena Mizunashi out of the hospital.[ch. 600] In the past, he accidentally exposed Shuichi Akai's identity as an FBI agent to the Black Organization and impeded his mission as a spy.[ch. 607] He felt his mistake caused Akai's love interest to be killed by the Black Organization and has thus felt indebted to Akai ever since.[ch. 607] Camel is named after Lieutenant Dren from Mobile Suit Gundam, who is the second-in-command of Camel Squadron under Char Aznable.[vol. 58:afterword] His Japanese voice actor is Kiyoyuki Yanada. Rei Furuya (降谷 零, Furuya Rei) is an agent of the National Police Agency Security Bureau Security Planning Division (警察庁警備局警備企画課, Keisatsuchō Keibi-bu Keibi-Kikaku-ka). He is also known as Toru Amuro (安室 透, Amuro Tōru) and working undercover in the Black Organization with the codename Bourbon (バーボン, Bābon). Rei feigns interest in being Richard's apprentice in order to gather information on Shiho Miyano. After Shiho fakes her death, he begins to suspect Conan of being the one behind Richard's deductions. Due to a past incident, he despises Shuichi Akai and later discovers that he is still alive. He planned to turn Shuichi over to the Black Organization to gain the Organization's trust and get closer to the heart of the Organization. However, Conan managed to outsmart his plan with the help of Shuichi. He is often seen working with Vermouth, but is unclear how much the two trust or know about each other. It is revealed that he knows Vermouth's relationship to the boss. His voice actor is Tōru Furuya. Yoko Okino (沖野 ヨーコ, Okino Yōko) is a young pop star idol who is a regular focus of worship by Richard Moore.[ch. 6] She has a number of appearances throughout the series, mostly as a prominent guest at some social gatherings which turn into criminal cases.[ch. 322] In one of the cases, she is revealed to be a former member of a girl group called Earth Ladies.[vol. 32] Her Japanese voice actress is Yuri Amano for episodes 3 to 122 and Miki Nagasawa from episode 249 onwards and her English voice actress is Elise Baughman. Booker Kudo, known in Japan as Yusaku Kudo (工藤 優作, Kudō Yūsaku), is Jimmy Kudo's father.[ch. 49] He is a famous author of detective stories and created the popular Night Baron (闇の男爵, Yami no Danshaku) character.[ch. 51] He is extremely intelligent, with deduction skills even superior to Jimmy's, and often helped the police solve cases in the past.[ch. 138] He was the one who created the name Kaito Kid from the Phantom Thief 1412 moniker.[ch. 573] It was even hinted that he may have known Toichi Kuroba was the Kaito Kid he was facing. His Japanese voice actor is Hideyuki Tanaka and his English voice actor was Randy Tallman. Booker was later voiced by John Swasey in The Phantom of Baker Street movie. Vivian Kudo, known in Japan as Yukiko Kudo (工藤 有希子, Kudō Yukiko), is Jimmy Kudo's mother and wife of Booker Kudo.[ch. 49] Her maiden name is Fujimine (藤峰).[ch. 414] She was a former actress who was trained in the art of disguise by Toichi Kuroba but gave up her career at age twenty to marry Booker.[ch. 49, 573] She occasionally shows up in Japan to see her son. Because of her reputation as the wife of a famous mystery author and for involving herself in some criminal cases which she occasionally helps to solve, she has been given the nickname, "The Night Baroness" after the main character that her husband created for his mystery novels.[ch. 351] Her Japanese voice actress is Sumi Shimamoto and her English voice actress is Laurie Steele. Vivian was inspired by Fujiko Mine from Lupin III and represents her good side, while Vermouth represents the bad. The Yukiko Fujimine name is a combination of Fujiko Mine and the first name of Fujiko's former voice actress, Yukiko Nikaido. Eva Kaden, known in Japan as Eri Kisaki (妃 英理, Kisaki Eri), and dubbed by Funimation as Eva Kadan, is Rachel Moore's lawyer mother who has been separated from Richard for the last ten years.[ch. 107] She is known as the Queen of the legal world.[ch. 267] She still wears her wedding ring and still cares for him, but is not above testing his love for her.[ch. 107,163-165] She is also highly skilled in Judo, having been taught by Richard,[ch. 107] but bad at cooking skills and has a Russian Blue kitten named Ricky (Goro in Japan) that was based on Richard's name.[ch. 529] 20 years ago, she and Vivian Kudo were classmates at Teitan High; they were so popular that the school had to cancel their beauty pageant.[ch. 412] Her Japanese voice actress was Gara Takashima and her English voice actress is Julie Mayfield. Her name, Eri Kisaki, originates from Ellery Queen;[vol. 11] Kisaki (妃) means "Queen." Originally the protagonist of Gosho Aoyoma's Magic Kaito series, Kaito Kid (怪盗キッド, Kaitō Kiddo) is a gentleman thief who employs the use of magic tricks to steal gems in his heists.[ch. 157] He is a master of disguise and often escapes from the police through the use of his hang glider. He appears in Case Closed to perform daring thefts while a large audience watches.[ch. 453, 631] His true identity is Kaito Kuroba (黒羽 快斗, Kuroba Kaito). His striking resemblance to Jimmy Kudo allows him to impersonate Jimmy without the use of a mask. His Japanese voice actor is Kappei Yamaguchi and his English voice actor is Jerry Jewell. Sumiko Kobayashi (小林 澄子, Kobayashi Sumiko), Liz Faulkner as dubbed by Funimation, is the Junior Detective League's class teacher.[ch. 154] Actually a kind person, in her initial period at Teitan Elementary she was harsh and strict to her students, which was in fact prompted by a previous bad experience and her innate stage fright.[ch. 155] With the help of Conan and the junior detectives she has warmed considerably, and after having seen the Junior Detective League in action she has even appointed herself as their advisor.[ch. 517] When she wears contacts, she resembles officer Sato.[ch. 515] It is later revealed that she had a past childhood encounter with Inspector Santos and develops a relationship with him.[ch. 689] Her Japanese voice actress is Yuko Kato and her English voice actress is Stephanie Young. Tomoaki Araide (新出 智明, Araide Tomoaki) is a young doctor and the son of Richard Moore's physician.[ch. 234] He was once the basketball coach at Rachel's school and, upon their first encounter, thought to be a rival to Jimmy for Rachel's affection.[ch. 234] He has reappeared in Conan's vicinity on several occasions - seemingly at least; his identity was used by Vermouth in order to track down Shiho Miyano.[ch. 432] He was almost murdered by her to facilitate the cover, but the FBI had temporarily moved him to safety in America.[ch. 457] His Japanese voice actor is Hideyuki Hori. Jirokichi Sebastian, known in Japan as Jirokichi Suzuki (鈴木 次郎吉, Suzuki Jirokichi), is a glory hounding seventy-two-year-old man and Serena Sebastian's uncle.[ch. 453] Despite his age, he is very fit and is an active industrial advisor for the Suzuki company. Ever since the Kaito Kid stole his place on the paper's front page, he had been obsessed with catching Kid in order to raise his fame.[ch. 631] He loves to ride his customized accelerated motorcycle with his dog Lupin.[ch. 453] His great wealth allows him to buy top notch security and several ways of lock down to surround Kid, but so far none of his plans have worked. Even when Kaito Kid's theft is foiled, Conan usually ends up taking up the news spotlight.[ch. 631] His Japanese voice actor was Ichirō Nagai. After Ichirō Nagai's death, his Japanese voice actor is Kōsei Tomita. Eisuke Hondo (本堂 瑛祐, Hondō Eisuke) is Rachel Moore's very clumsy new classmate, eager to see the Sleeping Detective in action.[ch. 508] Conan suspects his actions may be an act as he was able to enter Richard's office undetected, and his behavior in checking with a child on whether he told the truth resembles that of Rena Mizunashi.[ch. 550-551] It is later revealed that Eisuke believed that Rena murdered his sister and father when in actuality, Rena was his sister under an alias.[ch. 604] Eisuke had leukemia when he was younger, but when Rena gave her a blood transfusion to save his life, his blood type changed from O to AB. Eisuke, after learning of his father and sister's career as CIA agents, turns down witness protection from the FBI, but then plans to go to America to pursue a career as a CIA agent. He tells Conan that he is going to confess his love to Rachel because of her kindness, but gives up when he sees Conan's reaction, and then reveals that he has known all along that Conan is Jimmy, having observed Richard's deductive style changing since Jimmy's disappearance and Conan's appearance.[ch. 621] In the anime series, he is voiced by Junko Noda. Masumi Sera (世良 真純, Sera Masumi) is a female teenage detective who has taken an interest in Conan's affairs. She has two older brothers, Shuichi Akai and Shukichi Haneda.[ch. 972] She is skilled at Jeet Kune Do, a hobby encouraged by her brother Shuichi who mailed her instruction videos while in elementary school.[ch. 859] It is revealed that she knows Conan is Jimmy Kudo and she had met him and Rachel 10 years ago at a beach somewhere in Japan.[ch. 972] She lived in America for three years. She is voiced by Noriko Hidaka. Shukichi Haneda (羽田 秀吉, Haneda Shūkichi) is a professional shogi player, as well as the former boyfriend of Yumi Miyamoto.[ch. 847] He is widely known by the name of Taiko Meijin (太閤名人, Taikō Meijin) in the world of shogi.[ch. 849] Yumi nicknames him 'Chukichi' (チュウ𠮷/秀𠮷(チュウキチ), Chūkichi) because he keeps eating cheese like a mouse which makes a noise that sounds a lot like 'Chu'.[ch. 946] He is also the middle brother of the Akai family, making him the sibling of Shuichi Akai and Masumi Sera.[ch. 972] His Japanese voice actor is Toshiyuki Morikawa. Mary (メアリー, Mearī) is a middle-school age girl with light hair who has been hiding in various hotels in Tokyo with Masumi Sera. Despite her appearance, she is actually a middle-aged woman and the mother of Shuichi Akai, Shukichi Haneda and Masumi Sera.[ch. 972] For some unknown reason, something like APTX 4869 caused her body to shrink from that of a middle-aged woman to that of a middle-school child.[ch. 974] Her eyes have a remarkable resemblance to those of Shuichi Akai and Masumi Sera. She is voiced by Atsuko Tanaka. The name changes done by Funimation Entertainment and Viz Media were highly criticized. Carlo Santos of Anime News Network criticized how they attempted to Americanize the main characters' names yet the secondary characters were able to keep their Japanese names. Eduardo M. Chavez of Mania.com and Jeffrey Harris of IGN agreed that the name changes were pointless. Due to the popularity of the series, the characters from the series were used in a pamphlet to introduce the 34th G8 summit and were used to promote general crime fighting. The characters were also featured on commemorative stamps. Statues of Jimmy Kudo, Conan Edogawa, and Rachel Moore are found at Hokuei, Tottori. Several figurines were produced based on the likeness of the characters in the Case Closed series. Many characters were also featured on trading cards from the Case Closed collectible card game. "Detective Conan characters". Yomiuri Telecasting Corporation. Retrieved January 16, 2010. ^ "Products -> Detective Conan Ten Seconds of Terror (show preview)." Shogakukan Asia. Retrieved on June 2, 2015. ^ a b キャラクター紹介 [Character Introductions] (in Japanese). Yomiuri Telecasting Corporation. Retrieved January 16, 2010. ^ a b c d e f g キャラクター紹介 [Character Introductions] (in Japanese). TMS Entertainment. Archived from the original on December 31, 2009. Retrieved December 31, 2009. ^ a b c d e f g h i j "The Big Shrink". Case Closed. Season 1. May 24, 2004. Cartoon Network. ^ a b c d e "Detective Conan: Kudo Shinichi's Written Challenge Cast" (in Japanese). Yomiuri Telecasting Corporation. Archived from the original on April 29, 2008. Retrieved January 28, 2010. ^ a b c d 工藤新一の復活！～黒の組織との対決 [Shinichi Kudo Returns! Showdown with the Black Organization] (DVD). B-Vision. March 28, 2008. ^ "Shioli Kutsuna" (in Japanese). beamie.jp. Retrieved July 22, 2011. ^ "Akira Kamiya to Leave Kogoro Mouri Role". Anime News Network. Archived from the original on September 20, 2009. Retrieved September 19, 2009. ^ "Rikiya Koyama to Voice Detective Conan's Kogoro Mouri". Anime News Network. October 27, 2009. Retrieved October 31, 2009. ^ Case Closed: The Phantom of Baker Street (DVD). Funimation. ^ a b c Case Closed: Captured in Her Eyes (DVD). Funimation Entertainment. December 29, 2009. UPC 704400078057. ^ "バレンタイン殺人事件" [Valentine Murder Case]. Detective Conan. Season 1. February 12, 1996. Nippon Television Network System. Yomiuri Telecasting Corporation. ^ "Tragic Valentine". Case Closed. Season 1. June 1, 2004. Cartoon Network. ^ "外交官殺人事件(前編)" [Diplomat Murder Case (Part 1)]. Detective Conan. Season 2. February 17, 1997. Nippon Television Network System. Yomiuri Telecasting Corporation. ^ "No Immunity For The Diplomat Part 1". Case Closed. Season 2. August 12, 2004. Cartoon Network. ^ "浪花の連続殺人事件" [The Naniwa Serial Murder Case]. Detective Conan. Season 5. September 21, 1998. Nippon Television Network System. Yomiuri Telecasting Corporation. ^ a b Case Closed: The Last Wizard of the Century (DVD). Funimation Entertainment. December 15, 2009. UPC 704400078040. ^ a b "ジェットコースター殺人事件" [Roller Coaster Murder Case]. Detective Conan. Season 1. January 8, 1996. Nippon Television Network System. Yomiuri Telecasting Corporation. ^ "黒の組織と真っ向勝負満月の夜の二元ミステリー" [Head-to-Head Match With the Black Organization; Two Mysteries of the Night of the Full Moon]. Detective Conan. Season 12. January 5, 2004. Nippon Television Network System. Yomiuri Telecasting Corporation. ^ a b "青山剛昌先生が語る！ 真実へと迫る SECRET REPORT". Weekly Shōnen Sunday (in Japanese). Shogakukan (33): 10. July 31, 2013. ASIN B00G2GOHDM. ^ a b c "ブラックインパクト! 組織の手が届く瞬間" [Black Impact! The Moment the Black Organization Reaches Out!]. Detective Conan. Season 14. January 9, 2006. Nippon Television Network System. Yomiuri Telecasting Corporation. ^ INC., SANKEI DIGITAL (December 13, 2017). "【ネタバレ注意】名探偵コナン「あの方」の正体ついに明かされる　作者の青山剛昌氏「皆びっくりする」". sankei.com. Retrieved December 14, 2017. ^ "黒の組織10億円強奪事件" [The Black Organization: 10 Billion Yen Robbery Case]. Detective Conan. Season 5. December 14, 1998. Nippon Television Network System. Yomiuri Telecasting Corporation. ^ "ゲーム会社殺人事件" [Game Company Murder Case]. Detective Conan. Season 2. April 14, 1997. Nippon Television Network System. Yomiuri Telecasting Corporation. ^ Game Gone Bad (DVD). Funimation Entertainment. November 12, 2004. UPC 704400078149. ^ "黒の組織との再会(灰原編)" [Meeting With the Black Organization Again (Haibara Part)]. Detective Conan. Season 7. January 17, 2000. Nippon Television Network System. Yomiuri Telecasting Corporation. ^ a b "本庁の刑事恋物語(前編)" [Metropolitan Police Detective Love Story (Part 1)]. Detective Conan. Season 6. May 24, 1999. Nippon Television Network System. Yomiuri Telecasting Corporation. ^ Case Closed: The Time Bombed Skyscraper (DVD). Funimation Entertainment. November 3, 2006. UPC 704400077906. ^ "6月の花嫁殺人事件" [A June Bride Murder Case]. Detective Conan. Season 1. June 3, 1996. Nippon Television Network System. Yomiuri Telecasting Corporation. ^ "Wedding Day Blues". Case Closed. Season 1. June 23, 2004. Cartoon Network. ^ a b "風林火山 迷宮の鎧武者" [Fūrinkazan - The Mysterious Armoured Knight]. Detective Conan. Season 17. November 3, 2008. Nippon Television Network System. Yomiuri Telecasting Corporation. ^ "追いつめられた名探偵!連続2大殺人事件" [Caught Up With the Great Detective! 2 Murder Cases!]. Detective Conan. Season 4. March 23, 1998. Nippon Television Network System. Yomiuri Telecasting Corporation. ^ Jimmy Kudo Revealed (part 3) (DVD). Funimation Entertainment. February 17, 2009. UPC 704400077999. ^ "シカゴから来た男(前編)" [The Man From Chicago (Part 1)]. Detective Conan. Season 10. April 23, 2001. Yomiuri Telecasting Corporation. ^ "バトルゲームの罠(前編)" [The Battle Game Trap (Part 1)]. Detective Conan. Season 9. February 26, 2001. Nippon Television Network System. Yomiuri Telecasting Corporation. ^ "赤白黄色と探偵団" [Red, White, Yellow, and the Detective Boys]. Detective Conan. Season 17. July 14, 2008. Nippon Television Network System. Yomiuri Telecasting Corporation. ^ "謎めいた乗客(後編)" [The Mysterious Passenger (Part 2)]. Detective Conan. Season 9. April 23, 2001. Nippon Television Network System. Yomiuri Telecasting Corporation. ^ "赤と黒のクラッシュ 覚醒" [Clash of Red and Black! (Awakening)]. Detective Conan. Season 17. February 25, 2008. Nippon Television Network System. Yomiuri Telecasting Corporation. ^ "アイドル密室殺人事件" [An Idol's Locked Room Murder Case]. Detective Conan. Season 1. January 22, 1996. Nippon Television Network System. Yomiuri Telecasting Corporation. ^ "Beware of Idols". Case Closed. Season 1. May 26, 2004. Cartoon Network. ^ a b "江戸川コナン誘拐事件" [Edogawa Conan Kidnapping Case]. Detective Conan. Season 2. January 13, 1997. Nippon Television Network System. Yomiuri Telecasting Corporation. ^ a b "Conan Is Kidnapped". Case Closed. Season 2. August 5, 2004. Cartoon Network. ^ "コーヒーショップ殺人事件" [Coffee Shop Murder Case]. Detective Conan. Season 2. September 9, 1996. Nippon Television Network System. Yomiuri Telecasting Corporation. ^ "Murder At The Local Diner". Case Closed. Season 2. July 19, 2004. Cartoon Network. ^ Aoyama, Gosho (April 18, 1988). "蘇る怪盗" [Return of the Mysterious Thief]. まじっく快斗 [Magic Kaito] (in Japanese). Volume 1. Shogakukan. ISBN 4-09-122081-9. ^ Detective Conan: Magician of the Silver Sky (DVD). Shogakukan. December 15, 2004. ASIN B000666UY8. ^ "コナンVS怪盗キッド" [Conan vs. Kaito Kid]. Detective Conan. Season 3. September 22, 1997. Nippon Television Network System. Yomiuri Telecasting Corporation. ^ "帝丹小7不思議事件" [The Seven Mysteries of Teitan Elementary School Case]. Detective Conan. Season 5. August 10, 1998. Nippon Television Network System. Yomiuri Telecasting Corporation. ^ School of Ghouls (DVD). Funimation Entertainment. May 12, 2009. UPC 704400078019. ^ "暗闇の中の死角(前編)" [The Blind Spot in the Darkness (Part 1)]. Detective Conan. Season 7. November 29, 1999. Nippon Television Network System. Yomiuri Telecasting Corporation. ^ "怪盗キッドの驚異空中歩行" [Kaito Kid's Miracle Midair Walk]. Detective Conan. Season 13. April 12, 2004. Nippon Television Network System. Yomiuri Telecasting Corporation. ^ "もう戻れない二人(前編)" [The Two Who Can't Return Anymore (Part 1)]. Detective Conan. Season 15. February 6, 2006. Nippon Television Network System. Yomiuri Telecasting Corporation. ^ ""Tragedy of the Red Woman: Evil Spirit"". Detective Conan. Episode 755 – via Netflix. ^ Credits from "幽霊ホテルの推理対決(前編)". 名探偵コナン. Season 21. February 18, 2012. Nippon Television Network System. ^ Santos, Carlo (November 3, 2004). "DVD 1: Secret Life of Jimmy Kudo". Anime News Network. Retrieved January 28, 2010. ^ Jeffrey Harris (September 27, 2007). "Case Closed - 3.2: Death Wears a Blindfold DVD Review". IGN. Retrieved January 28, 2010. ^ 名探偵コナン-サミットガイド- [Detective Conan - Guide Summit] (in Japanese). Ministry of Foreign Affairs (Japan). Archived from the original on January 3, 2011. Retrieved January 28, 2010. ^ "Detective Conan Helps Kids Fight Crime". Anime News Network. September 18, 2006. Retrieved December 17, 2009. ^ "Detective Conan Special Stamps Stamp Collection" (in Japanese). Tokyo, Japan: Japan Post. Archived from the original on December 25, 2009. Retrieved December 17, 2009. ^ "Statue of Shinichi Kudo" (in Japanese). Conan-Town.jp. Archived from the original on April 12, 2010. Retrieved January 28, 2010. ^ "Statue of Conan Edogawa" (in Japanese). Conan-Town.jp. Archived from the original on April 11, 2010. Retrieved January 28, 2010. ^ "Daiei Elementary" (in Japanese). Conan-Town.jp. Archived from the original on May 7, 2010. Retrieved January 28, 2010. ^ "Detective Conan Figurines". Bandai. Retrieved February 7, 2010. Aoyoma, Gosho. Detective Conan (名探偵コナン, Meitantei Konan) (in Japanese). Shogakukan.